A line-scan camera has a single row of pixel sensors, instead of a matrix of them. The frames are continuously fed to a computer that joins them to each other and makes an image. This makes possible sharp pictures of objects that have passed the camera at high speed. Sporting races commonly use this kind of camera to make photo finishes, i.e. determine the winner when multiple competitors cross the finishing line at nearly the same time. 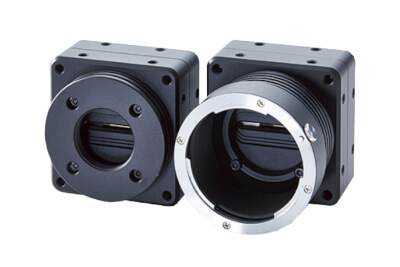 These cameras can also be used as industrial instruments for analyzing fast processes. 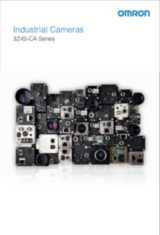 Camera Link is a serial communication protocol standard designed for computer vision applications based on the National Semiconductor interface Channel-link. It was designed for the purpose of standardizing scientific and industrial video products including cameras, cables and frame grabbers. The standard is maintained and administered by the Automated Imaging Association or AIA, the global machine vision industry's trade group. Camera Link uses one to three Channel-link transceiver chips with four links at 7 serial bits each. At a minimum, Camera Link uses 28 bits to represent up to 24 bits of pixel data and 3 bits for video sync signals, leaving one spare bit. The video sync bits are Data Valid, Frame Valid, and Line Valid. The data are serialized 7:1, and the four data streams and a dedicated clock are driven over five LVDS pairs. The receiver accepts the four LVDS data streams and LVDS clock, and then drives the 28 bits and a clock to the board. The camera link standard calls for these 28 bits to be transmitted over 4 serialized differential pairs with a serialization factor of 7. The parallel data clock is transmitted with the data. Typically a 7x clock must be generated by a PLL or SERDES block in order to transmit or receive the serialized video. To deserialize the data, a shift register and counter may be employed. The shift register catches each of the serialized bits, one at a time, then registers the data out into the parallel clock domain - once the data counter has reached its terminal value. Complementary metal–oxide–semiconductor (CMOS) /ˈsiːmɒs/ is a technology for constructing integrated circuits. CMOS technology is used in microprocessors, microcontrollers, static RAM, and other digital logic circuits. CMOS technology is also used for several analog circuits such as image sensors (CMOS sensor), data converters, and highly integrated transceivers for many types of communication. Frank Wanlass patented CMOS in 1963 (US patent 3,356,858). CMOS is also sometimes referred to as complementary-symmetry metal–oxide–semiconductor (or COS-MOS). The words "complementary-symmetry" refer to the fact that the typical digital design style with CMOS uses complementary and symmetrical pairs of p-type and n-type metal oxide semiconductor field effect transistors (MOSFETs) for logic functions. Two important characteristics of CMOS devices are high noise immunity and low static power consumption. Since one transistor of the pair is always off, the series combination draws significant power only momentarily during switching between on and off states. Consequently, CMOS devices do not produce as much waste heat as other forms of logic, for example transistor–transistor logic (TTL) or NMOS logic, which normally have some standing current even when not changing state. CMOS also allows a high density of logic functions on a chip. It was primarily for this reason that CMOS became the most used technology to be implemented in VLSI chips. The phrase "metal–oxide–semiconductor" is a reference to the physical structure of certain field-effect transistors, having a metal gate electrode placed on top of an oxide insulator, which in turn is on top of a semiconductor material. Aluminium was once used but now the material is polysilicon. Other metal gates have made a comeback with the advent of high-k dielectric materials in the CMOS process, as announced by IBM and Intel for the 45 nanometre node and beyond.